An early cropping heirloom variety renowned for its fine texture, close grain and superb flavour, this compact turnip with small tops is ideal as a catch crop. Make the best use of available space and grow between rows of slower growing vegetables. Outdoors, sow thinly, March-July, where they are to crop, 1.5cm (½") deep, directly into finely-prepared, fertile soil, which has already been watered. Allow 30cm (1') between rows. Seedlings usually appear in 14-21 days. Thin out to 10cm (4”) apart. Water well until plants are established. Regular sowings, made every two to three weeks, will ensure a continuous supply. Harvest: June-October. 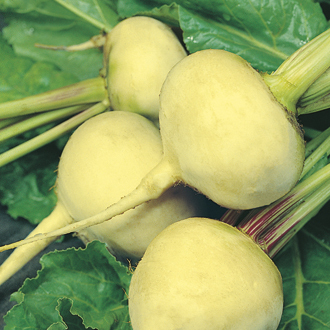 Turnips are best eaten small and young. For baby turnips, harvest when the diameter of a golf ball. Take alternate plants, leaving others to mature.